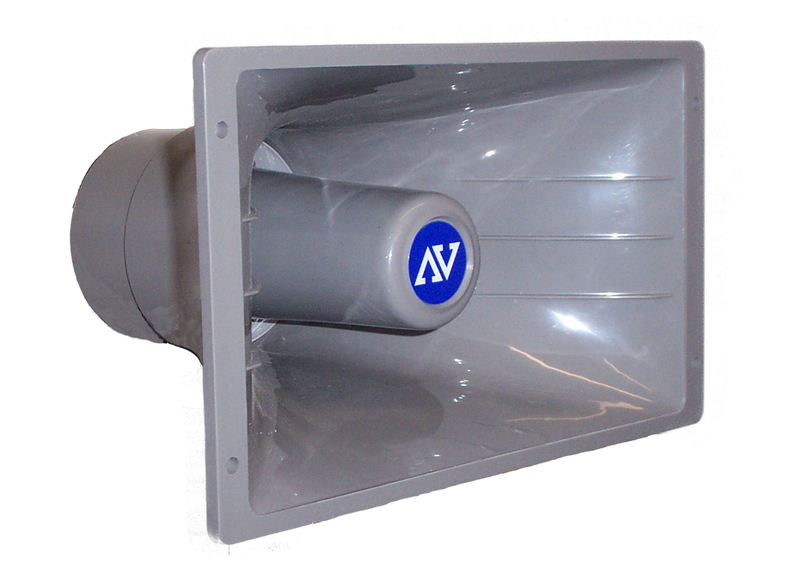 Do you need an outdoor mountable horn speaker system for your restaurant, school, or organization? AmpliVox Sound Systems allows you to custom build a mountable speaker system that easily installs on a wall, ceiling or on the ground both indoor or outdoors. You can easily project your voice and message or music to your customers in style. They allow the optimal customability for users so they are not hindered by design, size, or space issues. Pick and choose up to four speakers or horns (using two Y-Connectors) and mount them wherever you want to project your sound. The horns have a very wide range while the companion speakers are stylish and better suited for music and other types of audio with a wider frequency. 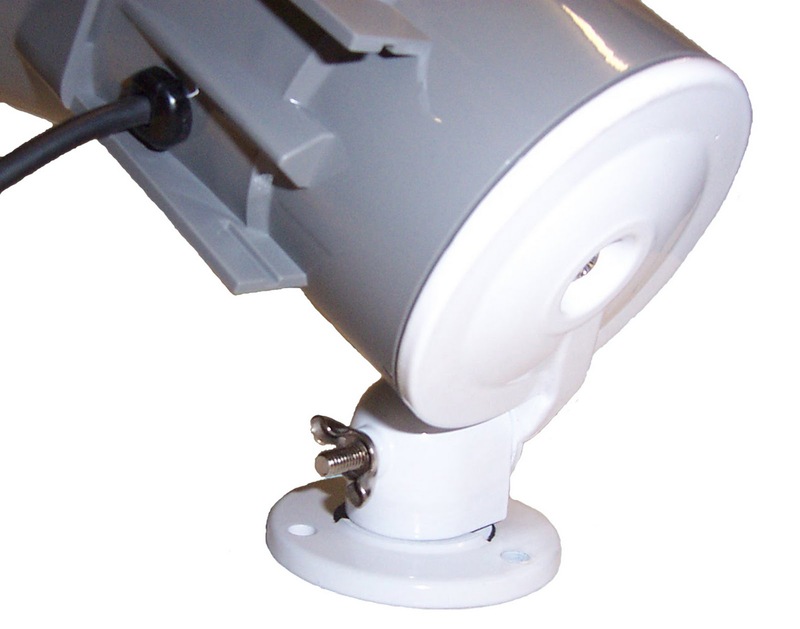 Some of our horn and paging speakers are weatherproof and ideal for outdoor situations. 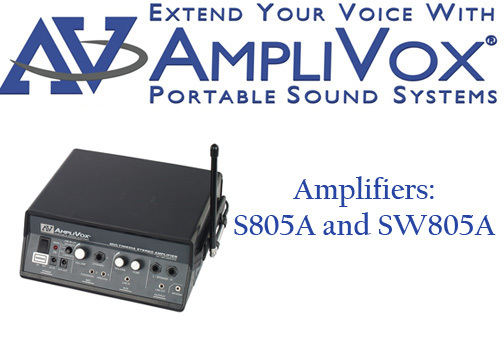 The wireless microphone makes speaking through the speakers easy to use through the SW805A Amplifier. 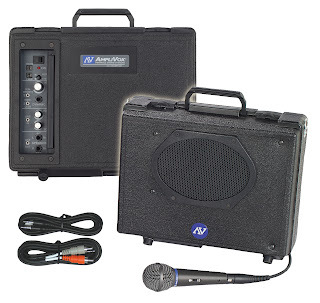 The amplifier is battery-powered or can be plugged in using AC power for convenience. 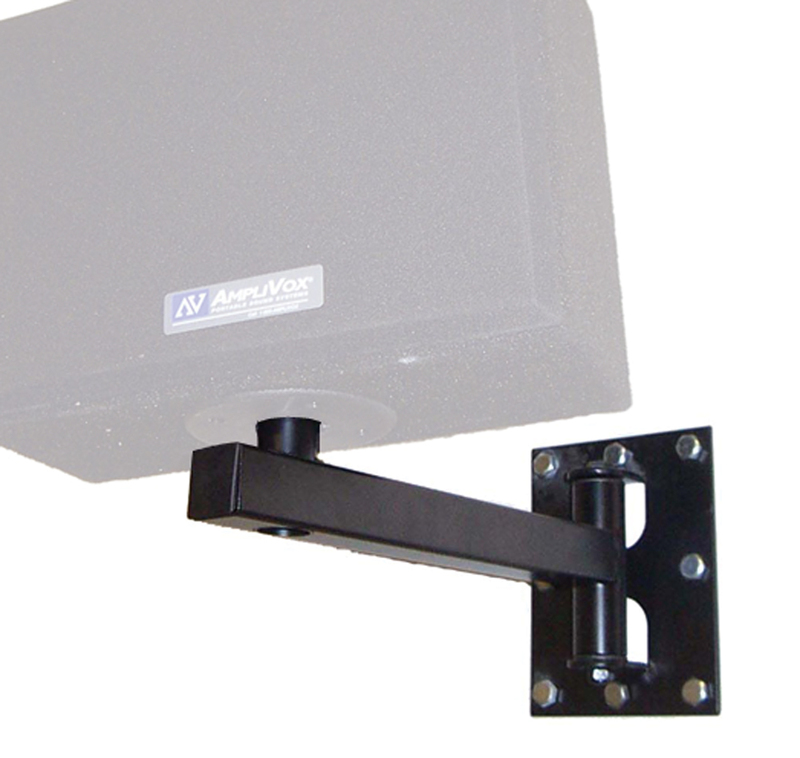 The surface mount speaker has optional mounting brackets for hanging and placement as ceiling speakers. These quality loudspeakers come preassembled and are a versatile alternative to guest paging systems with a variety of different uses. Although not used as in wall speakers, installing these speakers with wall mounts is easy. Take the speakers/horns off of their wall mounts to post onto a tripod for extra utility during public speaking presentations. Use it as an intercom to call waiting customers to their table, for the concierge to call waiting guests, for the valet to communicate to others, or to play music in a restaurant. The SW805A 50 Watt Multimedia Stereo Amplifier allows users to use the line in port to use an iPod, CD player, LCD projector, or a computer through the system while the line out port allows presenters to record their presentation while they speak. The different mic inputs available allow for any type of microphone you want; dynamic mic, wireless or condenser mic and allows users to control volume. Other great venues for one of these systems includes a nightclub, bar and lounge, coffee house, café, hotel, casino, golf course, banquet hall, grocery store, or a state or national park. 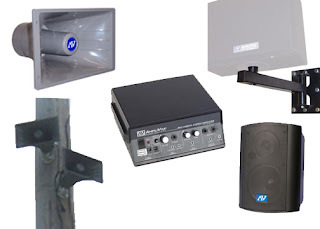 These are also an optimal PA system for outdoor sporting events sports complexes. Have your football, baseball, lacrosse, and track and field announcers use our system to clearly project instructions, game play-by-play, and race results. 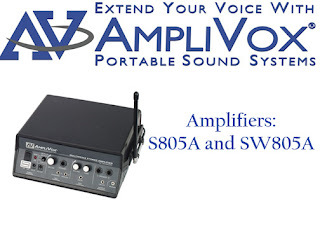 Whether you live in Boston, MA, Polk, FL, or on Mirage Ave, AmpliVox has a solution for you. Call (800) 267-5486 for more information or recommended packages for your situation. The Pink Podium Program is social! The following links are to our Facebook and Twitter pages. In just under a couple of weeks we have over 300 connections! 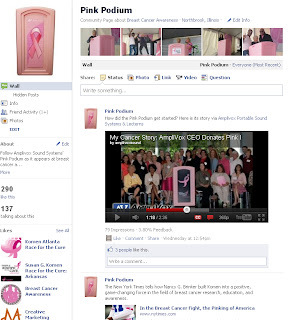 If you are not already a fan or follower, please join our communities for more information on the Pink Podium Promise, Breast Cancer Prevention Tips, and cancer news. "Thanks for your patience and a fine product. (Ambassador)... We really do appreciate the quality of the multi-media lectern." AmpliVox has done some recent work with restaurants, highlighting the useful applications our products have there. 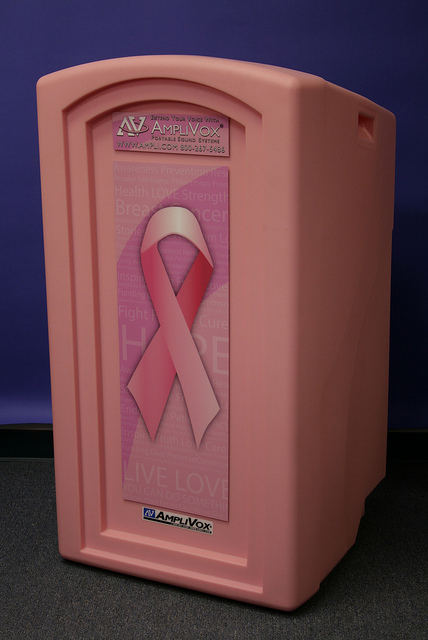 --Pinnacle Podium: This hard plastic podium is perfect for indoor/outdoor use as a hostess stand, valet stand, or presentation podium! --Multimedia Computer Lectern: This easily movable lectern is durable and has two locking cabinets to protect your belongings and technology. 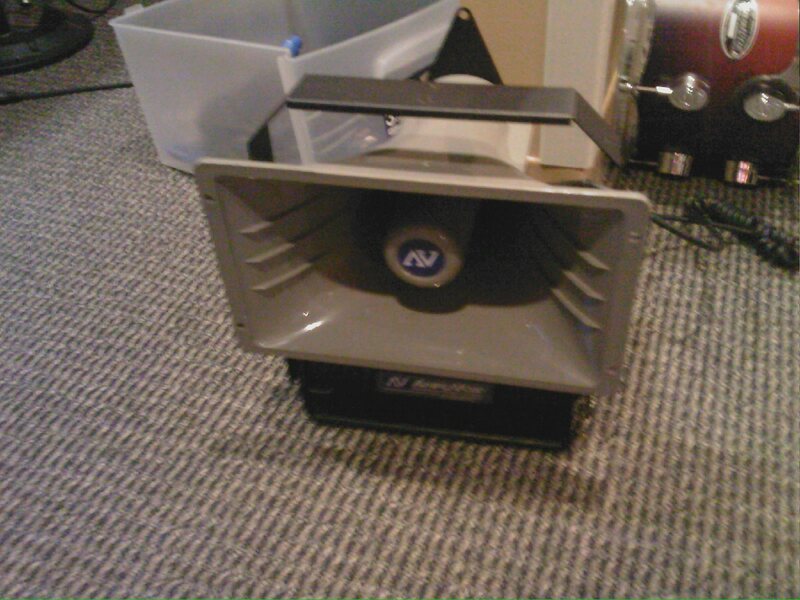 It has a slide out shelf and rolling casters and features an optional built in 50-watt sound system! --Full Height Wooden Lectern: This classic-style lectern is a durable and practical lectern for your hostess stand needs. 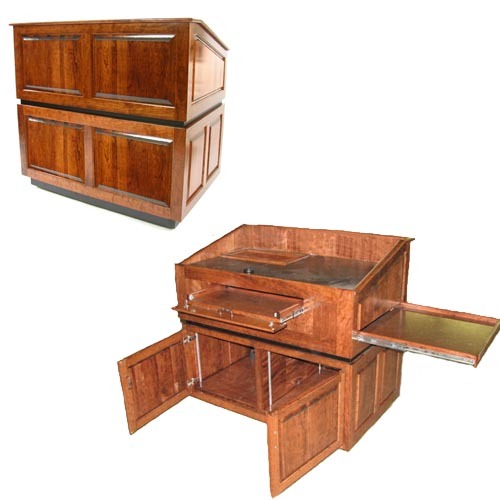 It comes in two different styles--medium oak and mahogany. --Custom Mountable Speaker Kits (pictured on right): These kits allow you to create the perfect custom system to meet your needs. 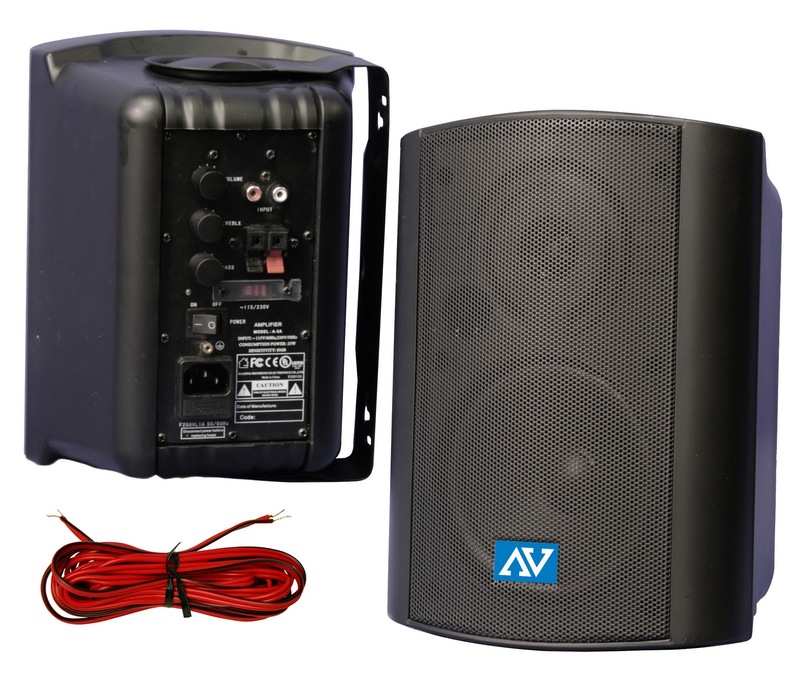 Just add any of our horn/speaker systems to an AmpliVox S805 amplifier and you have a powerful and custom PA system. 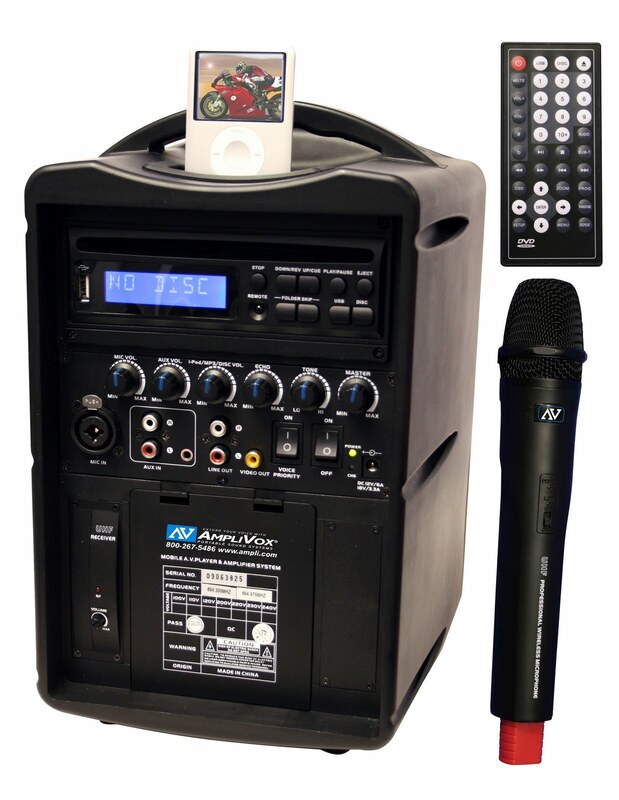 --iPod Portable PA System: The iPod System plays and charges your iPod and features automatic ducking so speakers can easily present over music. 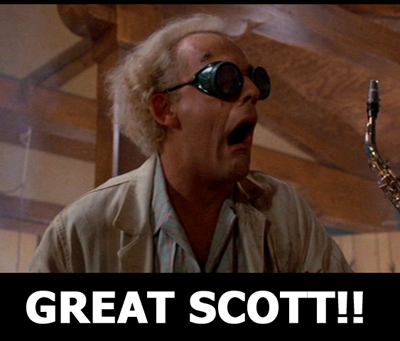 It is 30-watts and completely wireless! --Half-Mile Hailer Loudspeaker: This outdoor system is mountable and expandable with extra horns. It can be heard up to one half mile away and is a customer favorite. 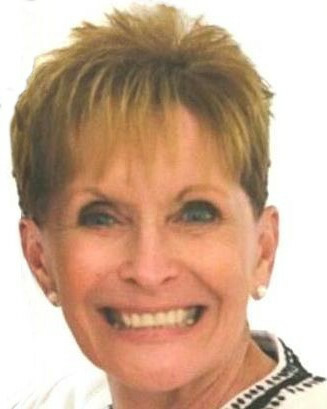 AmpliVox CEO's Cancer Story was recently mentioned in Crain's Chicago Business Magazine. Don Roth kept quiet about his experience with prostate cancer for two years, even though he contributes about $100,000 a year to cancer-awareness organizations. “I'm like a lot of males who choose to keep their feelings in,” says Mr. Roth, 71, owner and CEO of AmpliVox Sound Systems LLC in Northbrook. 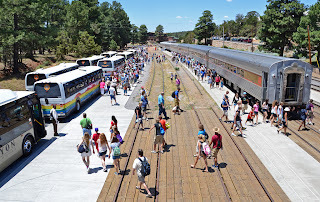 Great for Bus Tours! Everyone Can hear! "We use the SW222 Wireless Buddy to take new soldiers on bus tours of Washington, DC. We love the fact that the tour guide can set it down on a seat and talk and everyone on the bus can hear." "I just got my portable buddy today and must tell you guys at AmpliVox that this is by far the best PA I have ever used in the past 21 years of being an entertainer. For many years I used a much bigger system with 2 speakers, lots of wires and it was much heavier. After having my back hurting after each program from lifting the heavy system, I decided it was time for a change. I tried some other systems on the market that are also small and compact in size but none of them have even come close to the Portable Buddy. This system has made my life so much easier. I simply flip the switch on the system, turn on the transmitter and I am done... so simple! Thanks for making a great product with a great warranty." "I have used the Audio Buddy in a variety of room conditions and it has always come through with flying colors. The unit allows me to project my voice and sound from the video projector so every one can hear clearly. Having worked both in the education and business field for a number of years, the Audio Buddy is one of the wisest investments a presenter can make for their organization. " "Everybody was very pleased. My compliments. It worked well and I only had to flip 2 switches. Now the secretary could hear and he was able to take notes. We can take it around easily. It goes right inside our trunk." 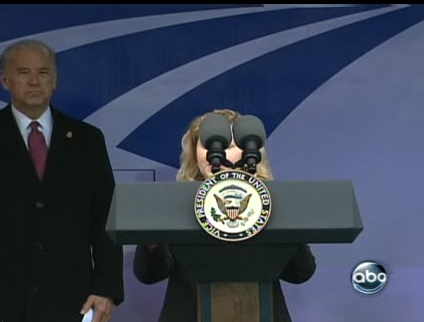 The woman behind the lectern is obviously way too short to reach the top of the podium to speak into the microphone. I'm sure she felt embarrassed and probably had a hard time communicating her message clearly because her audience was undoubtedly distracted and might have had to strain to hear the voice of this woman because she could not reach the microphone. They should have used an AmpliVox Adjustable Height Lectern. What are the benefits of an AmpliVox Adjustable Height Lectern? You do not need to worry about having presenters of various sizes. You can rest assured that you will not embarrass speakers like in this photo! You have many microphone options: gooseneck hot mic, wireless options (lapel, collar, headset, handheld mics). You are able to move the lecterns effortlessly. 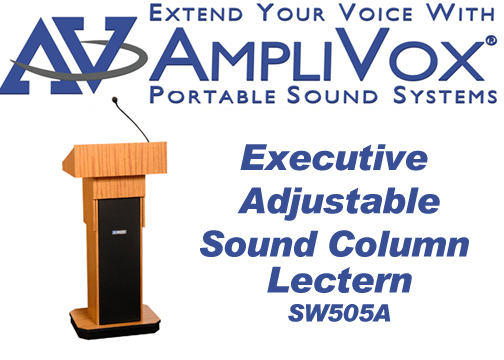 You will look good with AmpliVox's professional, elegant lecterns. 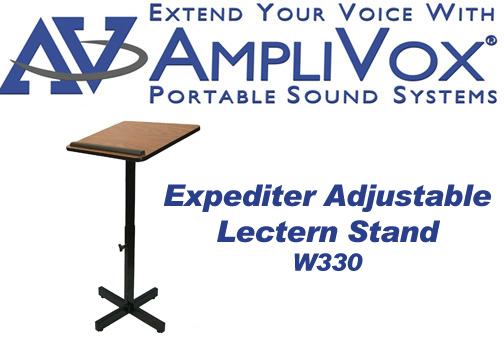 W330- Expediter Adjustable Lectern and Notes Stand -- This tiny note stand is a great option for a wide variety of presenters and is perfect for public speaking classes and classrooms. I searched long and hard for the best megaphone to buy. I didn't need it for any sort of emergency situation or for a construction site...I needed it for my band. Our singer uses it for some of our songs. We can be quite noisy too, so I needed something super loud that could be hand held. The main problem i ran into was that anything over 25Watts was a shoulder mounted monstrosity. I cant vouch for the scientific what not of their "piezo" technology, but this guy is REALLY loud. It's also the perfect size to hold. 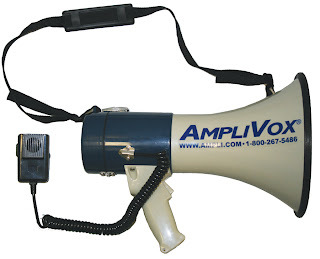 It also has the battery indicator on the side (i think this was the only model with that) which is super important considering it's use (and the fact that it uses so many batteries, though no more than other models).....Overall, the best megaphone I could find after extensive research. 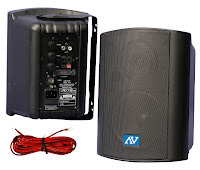 AmpliVox Portable Sound Systems has many products great for golf courses and country clubs. The Pinnacle Pro Starters Lectern is specially made for golf starters and ranger stations because it is elegant, convenient durable, waterproof, and green (click here for information on AmpliVox's Green Strategy). This other video lists the best AmpliVox products for use at a golf course. 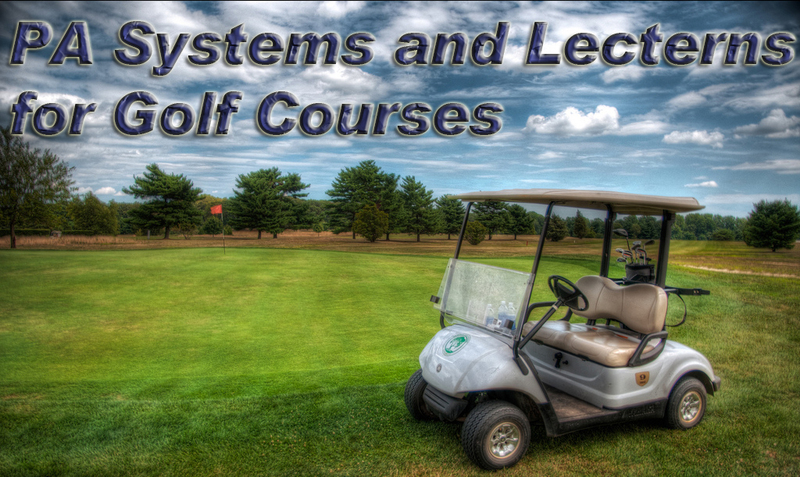 Our PA systems are a great way to communicate to patrons easily or shout down the fairways in case of emergency. Our selection of elegant lecterns and podiums for presentations and banquets. The watt (pronounced /ˈwɒt/ wot; symbol: W) is a derived unit of power in the International System of Units (SI), named after the Scottish engineer James Watt (1736–1819). The unit, defined as one joule per second, measures the rate of energy conversion. The watt is a unit of power. It is a Newton meter per second, or can be given as a joule per second. 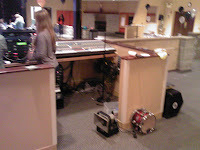 Several weeks ago, an AmpliVox employee was attending a surprise birthday party at a church in Rolling Meadows, IL, about twenty minutes from the AmpliVox offices in Northbrook, IL. After some birthday games and food, the employee was back by the sound mixer to choose some music for the party. He almost literally stumbled upon an AmpliVox Half-Mile Hailer. After a long day of work, the first thing in his mind was of course, "I can't get away from work!!!" But after that it began to sink in all the reasons that a church or other worship center would value having a Half-Mile Hailer as part of the team. Be able to communicate in the event of an emergency or a power outage. Have a back up system. What if the power goes out? Do you want to have to cancel your service and send hundreds home? Be flexible for outdoor events. 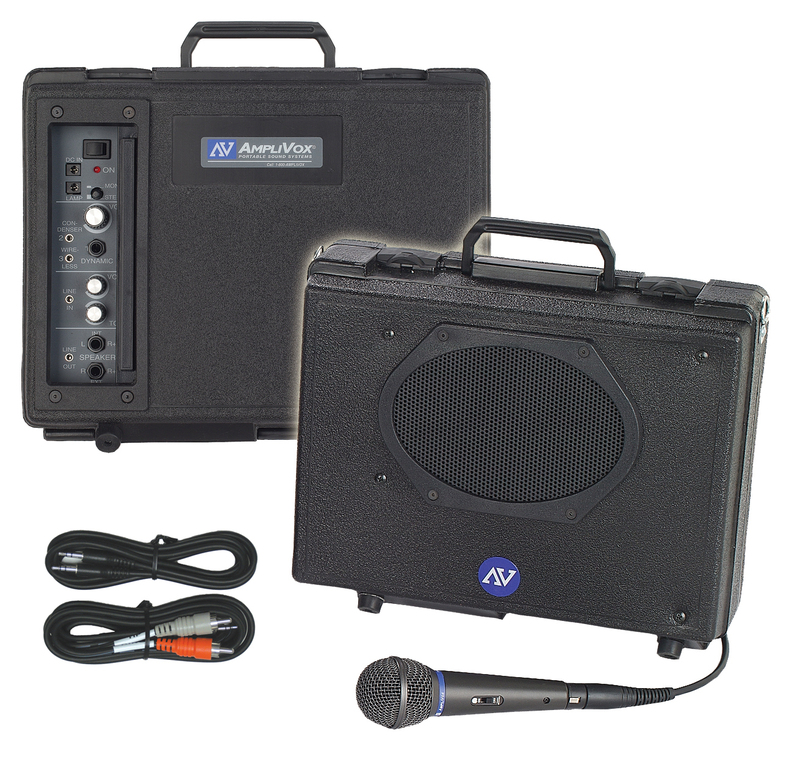 From time to time AmpliVox gets questions on our battery pack that we include in many of our PA Systems. The following video helps troubleshoot common battery problems like not installing the batteries right and also explaining how to charge the rechargeable batteries. Blog: FAQ: What is the Voice Priority Feature? "We use this PA system to make announcements in our large Cafeteria at work. It is also used by students and volunteers for musical entertainment. It is not for entertainment professionals, but is a great system for most businesses and home. The sound is loud and clear. 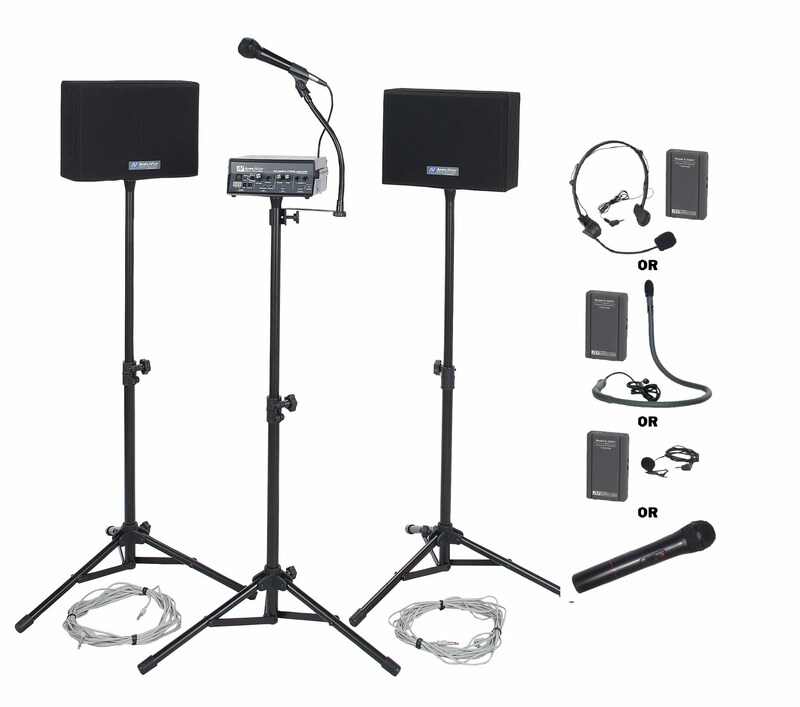 The system also comes with a wireless microphone that can be used a great distance away from the PA system. The microphone even works when you are in a different room than the PA system. The system is VERY SMALL, but WOW!"